Wherever you are in BlueCamroo, it's easy to create a task. And because Tasks are related to other data - like Customers, Projects or Cases, for example - all your team can see at a glance what's to be done and who's responsible. Every user in BlueCamroo has their own individual Task List, and creating tasks for a colleague is as quick and easy as creating a task for yourself. What's more, BlueCamroo takes care of notifying whomever the task is assigned to and providing reminders if necessary. You can even assign tasks to Customers and Suppliers by inviting them to work with you as free external users in BlueCamroo. If your business tracks time - and maybe even bills customers based on time spent - BlueCamroo's task management capabilities help you keep on top of progress and time. 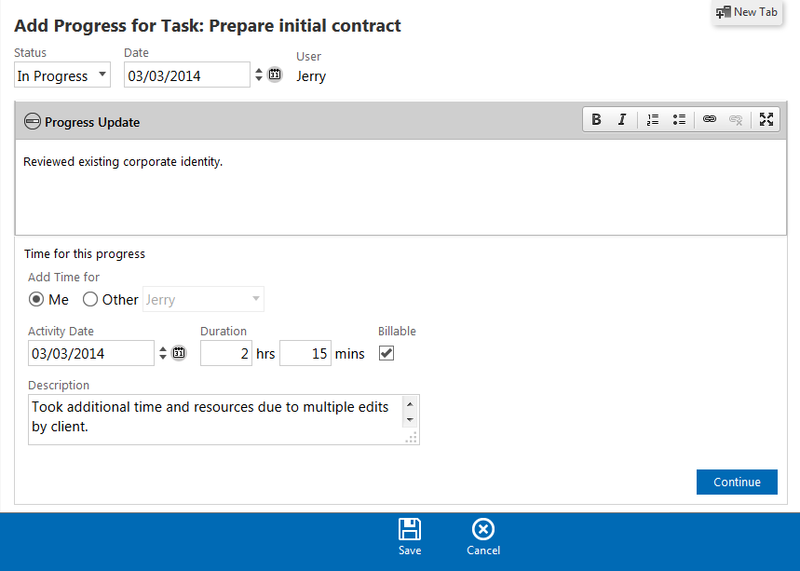 Every time you work on a task, simply add an update and record the time spent. The time you record will then 'roll up' to the related Project or Customer for billing. And when we say "add progress" we mean "add progress". You may have come across online Project Management tools that only allow you to mark a task Complete or Not Complete. We understand that the real world is more complex than that - you could come back to a task two or three (or more!) times and move it forward each time. So in BlueCamroo you can add as many Progress updates to a task as makes sense for you before you finally Close the task. Many online systems let you assign tasks to co-workers. BlueCamroo does more: it lets you know your task request has been acknowledged and accepted. And when people accept tasks, they become accountable for delivery. Even if your task gets handed off to another team member after it has been accepted, BlueCamroo tracks that reassignment and lets you know, so there's never any doubt about who is responsible. That's more than Task Management. It's Accountability Management - BlueCamroo style!